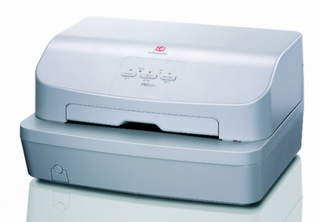 Olivetti passbook printers are widely used printer in post offices. Sometimes we find problem with printer when it stops printing. In that case, calibrating the printer can solve your problem. 1. Switch off the printer. 2. Open the top cover of the printer and keep Head of printer at extreme left side. 3. Press all three buttons ("Station 1", "Local" and "Station 2") and then switch on the printer. Printer will give a beep sound. 4. Now close the top cover of the printer and press "Station 1" two times. The print Head will start moving and roller will start rolling. 5. Now press "Station 2" once and then add a paper to the printer and again press"Station 2". 6. Printer should take paper inside and all LEDs should blink within 5-10 seconds. 7. If not, then keep pressing "Station 2" until all LEDs glow. 8. Now switch off the printer and take test print. To take test print, press "Station 2"and power on the printer. 9. If printer gives you the proper test page then congratulations, your printer has been troubleshooted. Thnx for considering my article. If you have any questions or any ideas (related to Hardware, Networking, Linux and Windows) you can feel free to share with me. My E-Mail ID : averma18jan82@gmail.com . You are also welcome to join me with google friend connect. how to configure margins of the printer.